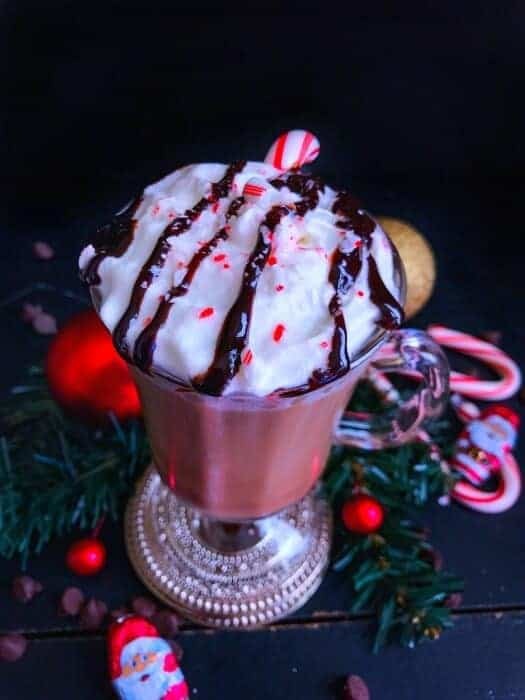 Easy Red Wine Hot Chocolate Recipe: is a perfect mix of wine and chocolate that guarantees a delicious warm hug in every sip. It’s super easy to make and instantly gives you that happy feel. Calling all Chocolate and Wine lover for our MUST HAVE Christmassy drink ‘ Easy Red Wine Hot Chocolate Recipe ‘ which I’m calling a warm, comforting hug in a mug kind of drink. I know most of us are happy drinking eggnogs, mulled wine, martinis, hot toddy’s or other cocktails. bBt the drink that’ll surprise you and is quite a refreshing change is this Red Wine Hot Chocolate. Now, I do love Hot Chocolate and must have tried dozens of different options but this ‘ Easy Red Wine Hot Chocolate Recipe ‘ is definitely my this year favorite. Also, I would say, a good option to use all that leftover red wine after your parties. 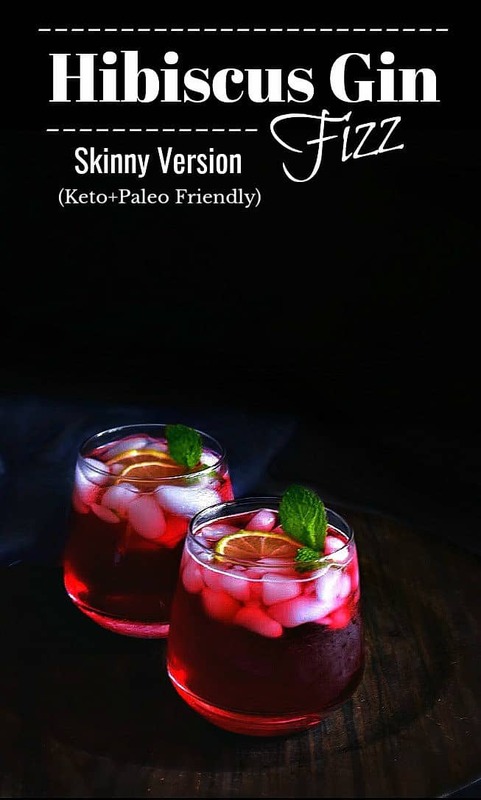 And, the best part, for this drink firstly, you don’t need tons of ingredients and secondly, you just need a small amount of wine (you could actually use those mini wine bottles). They end up being less expensive than opening that huge bottle of vodka/rum or whiskey to make other hot chocolates. 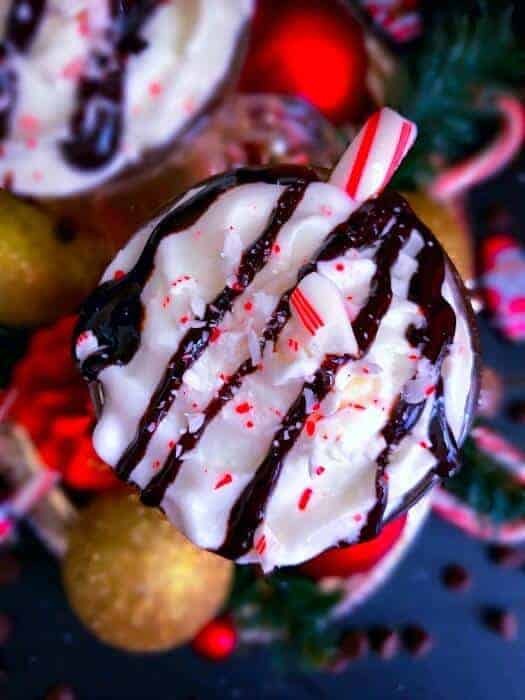 Since I’m making this for Christmas, I did add some crushed candy cane along on top but you can totally skip this if need be. The other hot chocolate favorite companion is marshmallow and I somehow find it overly sweet with this wine + chocolate combination, but if you like it that way, go for it! Also, I’m using ‘Cabernet Sauvignon’ for my Red Wine Hot Chocolate Recipe but you can use any red wine that you like. The drink is really simple to make but is packed with so much flavor and literally gives you that warm, fuzzy feeling…. So, don’t wait long, gather the ingredients, get all your favorite people around. And enjoy the holidays with love, laughter and tons of food and this Red Wine Hot Chocolate Recipe. Easy Red Wine Hot Chocolate Recipe is a perfect mix of wine and chocolate that guarantees a delicious warm hug in every sip. Makes 4 Cups. In a large pot, add milk, chocolate chips, cocoa powder, salt and cinnamon stick. Add the red wine, stir and lower the heat. Let this mixture simmer for 10 minutes (stir every minute). Turn off the heat and remove the mix from stove. Pour the Red Wine Hot Chocolate into 4 mugs. 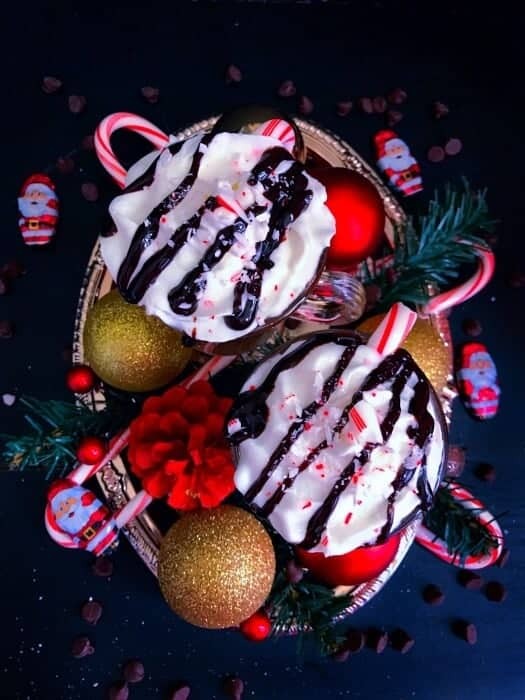 Decorate with Whipped Cream, Candy Cane and Chocolate Sauce. Serve Hot or Warm as per choice. 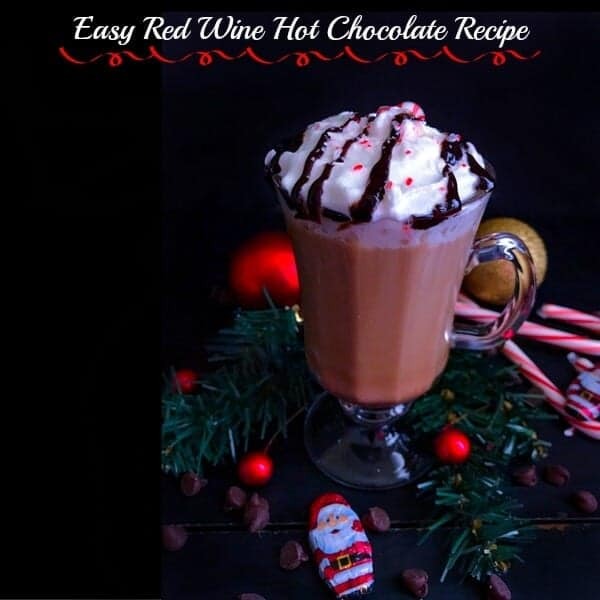 2 Replies to "Easy Red Wine Hot Chocolate Recipe - #RedWine"